If there is one aspect of snake anatomy and physiology that everybody is familiar with, it is probably their ability to consume prey many times larger than their own skull. One of the most bizarre feats one can witness in nature, is an egg-eating snake ingesting a massive egg. Even more amazing, and perhaps a little unsettling, is the spectacle of a giant constrictor ingesting a large grazing animal, which probably equates to you or I trying to swallow a basketball, with our arms tied behind our backs. So how do snakes achieve this? It is a common misconception that snakes dislocate their jaws to swallow prey. A dislocation is an abnormal disconnection of two bones at the joint; this would in fact be harmful to the snake. It would be counterproductive to impose a self-inflicted injury for the purpose of swallowing a meal and not to mention quite a complicated evolutionary trait to explain. The reality is much simpler, a snake has loosely connected jaw bones and elasticated skin. The bottom mandibles are not fused as in the human jaw, but rather connected by an elasticated ligament. The supratemporal and quadrate bones connect the mandibles to the cranium and partly dictate the limitations of the gape. However, just because the jaw can open wide enough to accommodate large prey does not guarantee it can be swallowed. 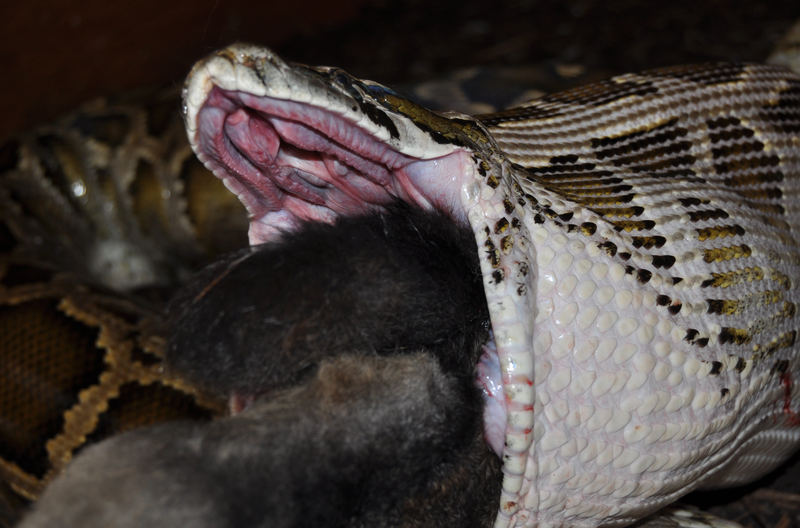 The maximum size of prey consumed is not dictated by the wide gape, but rather by the area of the buccal cavity that is available for prey to pass through, which is ultimately determined by the width of the snakes head. The structure of the macrostomatan jaw facilitates the ingestion of prey many times larger than the snake’s skull. The upper rows of teeth move independently in a series of ratchet movements which are reciprocated in combination by the mandibles, pulling the prey continuously further through the snakes buccal cavity. This series of movements is referred to as the ‘‘pterygoid walk’’, as the snake essentially walks its head over its meal. Snakes typically begin to eat a prey item once it has been overpowered to the point where it can no longer struggle and potentially cause damage. Prey are almost always swallowed head first, as this will cause the prey’s limbs to fold against the torso. 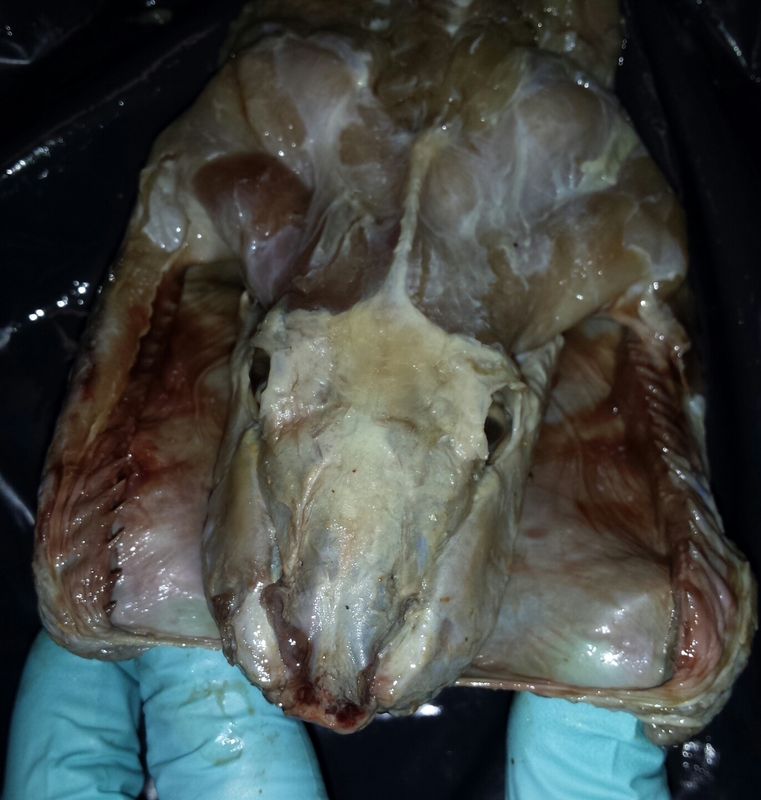 This streamlining of the prey prevents limbs from snagging and tearing the tissue within the gastrointestinal tract. The flexibility of the macrostomatan jaw becomes more apparent when the elasticated skin around the jaw stretches during cranial kinesis. This occurs when the mandibles move to accommodate the ingestion of a large meal by creating a wide gape facilitated by the streptostylic quadrate. The upper mandibles consist of four rows of teeth, which, although they can move independently, are less mobile than the lower mandibles as the cranium remains relatively intact. They are however, important for the intraoral manipulation of food. As one mandible moves forward to accommodate a portion of its prey, the other mandible maintains grip on the prey and directs it down the snake’s throat. This sequence continues until the prey is fully consumed. 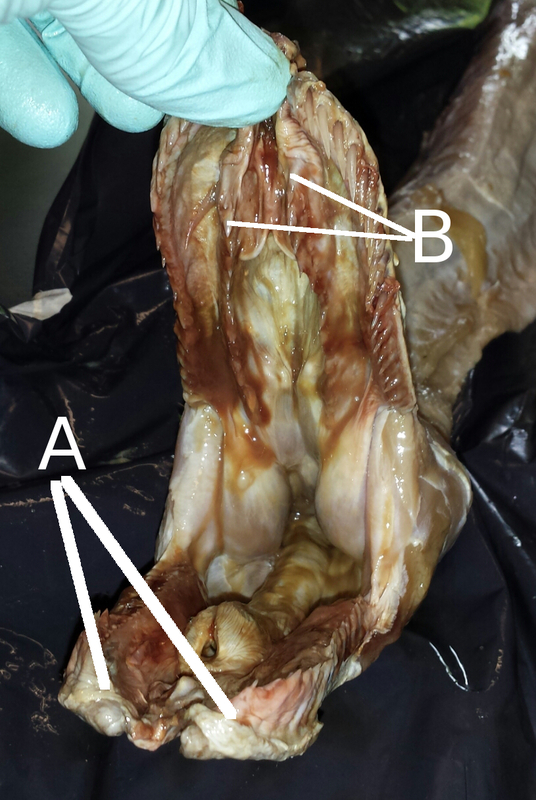 Once the head of the prey animal has passed through the buccal cavity, muscle waves generated by peristaltic contractions help propel the meal down the digestive tract. To prevent suffocation during the ingestion of a large meal, the snake may extend the glottis outside of the oral cavity, effectively creating a biological snorkel. Not all extant (living) snakes possess the macrostomatan jaw; It appears later in snake evolution and is absent from early forms. There are three major taxa: Scolecophidia are the most basal of extant snakes, they have a fossorial lifestyle, spending much of their lives burrowing underground. These early forms lack the macrostomatan jaw and thus feed on more manageable prey such as termites; often gorging themselves on the larvae after encountering a nest site. This group consists of ~340 species, including blind snakes, thread snakes and worm snakes. Alethinophidia is a clade formed by the remaining extant snakes, made up of ~2,640 species. This clade includes several taxa of which the most basal are considered semi-fossorial (such as pipe snakes, and shield-tailed snakes) and the more derived taxa all lie within Macrostomata (possessing the wide gape). The Core Macrostomatans refers to the more recently evolved boids (boas and pythons) and to the more advanced Caenophidia (The most recently evolved snakes, including most of those possessing a venom apparatus). (Click To Magnify) Snake Tree of Life (ToL): The tree depicts the major snake groupings with a pictured representative, the brown fields represent the two main branches. Scoleophidia represents the earliest branch off the snake ToL and they form their own group consisting of basal snakes which lack the macrostomatan jaw. Alethnophidia is the second major branch. The earliest group off this branch (represented here by a shield tail snake) also lack the macrostomatan jaw. The inner black circle represents the appearance of the macrostomatan jaw. The blue stripe represents the approximate timeline from the appearance of snakes in the fossil record to the present day. The evolution of the macrostomatan jaw comes with an inevitable trade-off. These snakes have traded powerful jaw pressure, as seen in crocodiles and turtles, for flexibility. Without this crushing jaw-pressure, snakes needed to adapt alternative means of subduing prey, with constriction and venom being the weapons of choice. Despite this cost, the trade-off has certainly been equitable, allowing snakes to be highly adaptable and to thrive in environments where available prey species may vary significantly in size and shape. Video available on Youtube under Creative Commons license. Eastern Worm Snake by Greg Schechter. Phipson’s shield tail by Sindhu ramchandran. Mexican Burrowing snake by Dawson. All used in creation of ToL image. All sourced under Creative Commons License. All other images property of JP Dunbar.